As the authorities continued to hunt them down, open war resulted in this area between 1702 and 1704. These particular Huguenots became known as the “Camisards,” and many testimonies have survived of signs and wonders among them. Many prophesied, even very young children. Often they were warned by the Spirit of impending danger from enemy forces, and were saved from death or capture. 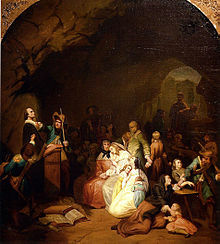 From several of those who eventually escaped to England, a collection of testimonies of these marvels appears in a book titled Le Théatre Sacré des Cévennes (The Sacred Theater of the Cevennes). Here is an excerpt of one such testimony by a man named Jean Cavalier, recorded January 1707 (translation mine). There was beginning to be a lot of talk around about the “Prophets” of our region, stories you’d hear. So when some friends invited me to one of these prayer “Assemblies,” though I was just a kid of 15 or 16 and not exactly given to devotion, I jumped on the chance, thinking that I might see there some of those “Inspired” ones who said such strange things. But no sooner had I entered the barn where everyone was, that I noticed a boy lying on his back going through curious agitations. This started to freak me out and really put me off. But then he started to speak, and he said among other things that there were some persons there in the gathering who had come merely out of curiosity, and in a mocking spirit, and that if they did not repent, God would point them out and they’d be put to shame. He added some other things like this, so clearly painting a picture of me, that he could not have represented my state of mind better if he had access to the very depths of my heart. And this shook me up no small bit. In my limited mindset I figured these folks for some kind of fortune tellers, as some people said. But anyway, this little “soothsayer” has spoken of persons–plural–and so I imagined that I was not the only one in there who found it all weird. So I hoped I’d escape notice, being only one of many, and I wished at that moment I was thirty miles away from there. I was repenting–of my decision to come–and I determined to make for the door and get out of there as fast as I could. Not only was I upset and frightened at this little boy’s calling out my very thoughts, but I was scared that he would call me by name or something even worse. I had never in my life found my self in such a predicament. But it got worse. With my only thought and desire to get out of there, I saw another very young boy–directly in my path–between me and the door–fall to the floor in even more violent agitations than his comrade, so to speak, and cry out loud that there was a person of ill will trying to leave, and that they should post people at the door to stop him lest he go and denounce the Assembly. Then this new “soothsayer” began to say out loud with the most perfect precision the things I had been saying to myself as the other one had begun speaking. Not only this, but he even called out my first and last names, and came and grabbed my arm, at which point he added several things to get me to humble myself before God, to repent, and to give Him glory etc. My inner trepidation turned to outright terror and I froze. I was cornered, because this last boy had spoken of one single person,–obviously me! As for the door–forget that. My God! I said to myself, who are these people? And who told these little boys everything that was in my heart? What am I going to do if they come at me? What will happen to me? What will my parents say? I was in a fix, for sure. And yet, I added, these people talk about God. Had they been Witches, they wouldn’t be saying all the good things they were. They wouldn’t be praying such fine prayers. They wouldn’t be singing Psalms and the two children wouldn’t have exhorted me to repent. These thoughts calmed my mind a bit and led me to pray to God. Then, something particular happened, which I must tell here. The second “soothsayer”–or rather Prophet–or I don’t know what–continued to speak. As he rattled off endless things against the morals of this perverse century, against the idolatry of the Papists, against all sorts of superstitions, etc. All of a sudden he stopped his discourse and speaking in a different tone, said that there were several believers wandering in the fields and forest nearby looking for the Assembly, and that to bring them in, someone had to go out and sing a Psalm. I’d had a mind to volunteer to go and sing with them, the perfect excuse to get me out the door, but I didn’t dare, out of fear for the “soothsayers” at the door. A group went out and began to sing. As for me, I continued to pray to God as best I could. I thought it would be a good sign if the singing actually did bring in more people as the little Prophet had predicted. We’ll see, I said, if what he said comes true or maybe it was all just coincidence–the things he’d said about me. As I stood there by myself, lo and behold, the people came back in with a bunch of others brought in by the Psalm-singing. That really got to me, and set my mind whirling, for at least a quarter of an hour, on such matters as a kid my age never had in his whole life. My opinion of the people began to change, as I reflected on things I had always heard, that it was only God who searches hearts and minds, that it could not be Satan who declared war on sin or glorified the name of God as they were doing at this Assembly. These thoughts really calmed me down, and even gave me joy. Then a third young boy fell down like the others. After some agitations, he got up, full of the Spirit, and said something like this: “I assure you, my child, you are safe here in this this Assembly. Never fear; I am with you. And I want now to put my Word in your mouth, so that you may console my people.” This moved me even more, and fortified my heart, seeing that they were no longer talking about me the way they were before. Whereas before I had only prayed in fear and trembling, gasping for breath, now I began to ask fervently that He would be pleased to let me know His will, so that He would fill me with horror for those things, if ever they came not from Him, and on the other hand, if they were Gifts of His Grace that he would imprint them on my heart. The young preacher prayed a wonderful prayer, to which I was extremely attentive, feeling propelled with a great zeal. He said next that the text of Scripture which was to be the subject of the message the Spirit was putting in his mouth was was Isaiah 55:1-2: ““Come, all you who are thirsty, come to the waters; and you who have no money, come, buy and eat!” etc. As for me, as he preached, as the young inspired boy spoke various things which particularly touched me and which I took closely to heart, I experienced an unspeakable contentment. I was thrilled when he said that the least and the simplest were of great worth in God’s sight. That it was those who were the most destitute that He wanted to enrich, since Jesus Christ Himself came not to call the righteous, but sinners to repentance. But one has to feel the misery, has to know the spiritual poverty and then to hunger and thirst, so as to be admitted to the banquet, to receive the wine and the mild, to be quenched in the river of His delights. My soul was overcome. I was outside of myself. It seemed to me that all these great things were for me alone. I was no longer wavering; my doubts vanished; I felt in myself that hunger and thirst for God’s graces. Yet in the sense of my deep unworthiness, my eyes became fountains of tears. This entry was posted in history, Holy Spirit, promptings of the Spirit, prophecy, prophet, Uncategorized. Bookmark the permalink.